I wasn't planning to do a Mothers' Day Gifts themed blog post- after all, it's not an occasion which my family & I particularly note, apart from the standard card & bouquet of blooms which my mum will be receiving this time next week (UK Mothers' Day is 3rd April). 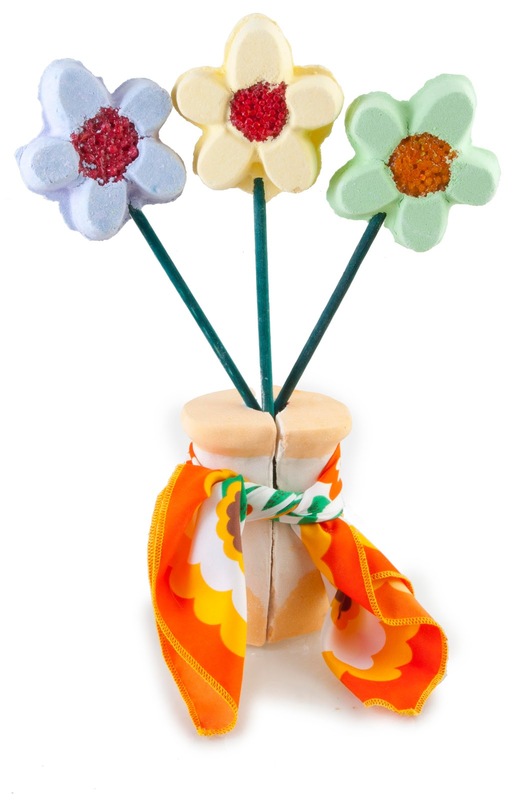 However, Lush have come up trumps once again and I couldn't resist sharing details of their Mothers' Day offering. For a token gift, I think these MUMS Bath Ballistics (£3.60 each) are absolutely adorable. The name is short for Chrysanthemums & the cute floral moulded versions of their signature Bath Ballistics are designed for those mums who like to receive something of the pampering variety. I really like that they are affordable, proving that you don't have to go OTT on the gifting to show you've put care & thought into the day. However, my favourite aspect of the Bath Ballistics is that they are presented on a stick, each with a label which has been implanted with flower seeds- the idea being that your mum plants it to grow her own flowers, with the stick being used to mark the spot. There are three to choose from, Avobath, Space Girl or Vanilla Fountain and if you can't decide then the set (pictured) is also available. If your mum is a fan of Lush, then why not take her for a girls' day at one of their stores?﻿ From 11am on Mothers' Day, stores nationwide will be hosting Mamma Mia parties with drinks & nibbles, retro tunes and instore pampering. Children will be kept occupied with finger painting & creating handmade Mothers' Day cards whilst mums are treated to complimentary skin & hair consultations and relaxing hand massages.